HomeOrgano GoldWhat is the difference between the Organo Gold Bronze, Silver and Gold starter packages? 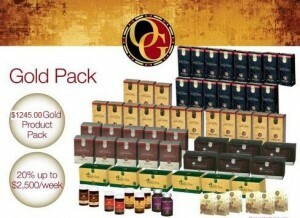 What is the difference between the Organo Gold Bronze, Silver and Gold starter packages? So you would like to enter into the Organo Gold world and want to get your hands on an Organo Gold starter package. The question is just which one you should buy? Read through the article and after reading you will for sure know which package to choose, based on the information given to you here. As you visit the Organo Gold website to sign up as a distributor you will first have to create yourself a user ID, give your email address and a password. Then you will need to read through the agreement and choose continue. On the next site of the registration process you will see something like this. 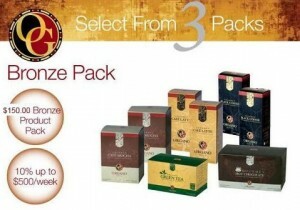 Which Organo Gold starter package to choose? 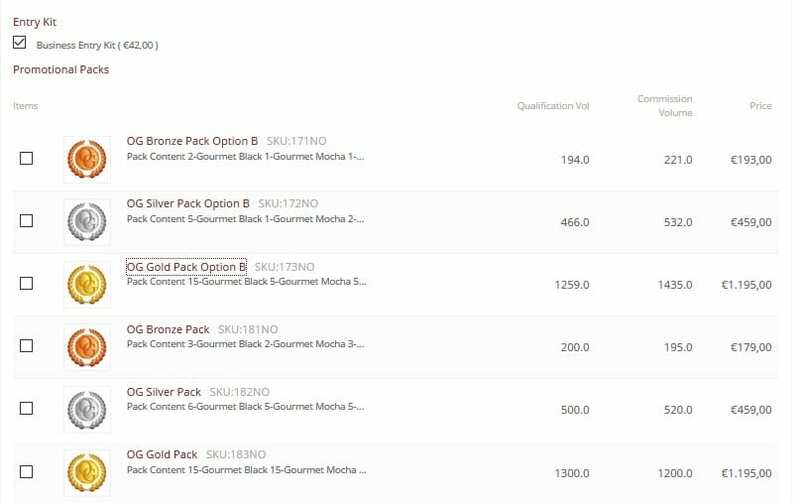 Should I go for Bronze, Silver og Gold package? Now what you need to know first is that you can join Organo Gold and shop at distributor prices without actually buying a starter package. All you need then is to go with the Business Entry Kit and skip any package. As you scroll further down you can still shop at distributor prices, so if all you want to is to buy from Organo Gold at distributor prices and you have no intention in earning money with Organo Gold or spreading the word, then skip the starter packages (bronze, silver and gold) and just go for the Entry Kit and order the products you are interested in at distributor prices afterwards. But, let us say that you actually want to earn money with Organo Gold and you want to spend some energy in building yourself a network. If that is true, then you will want to buy an opening package, and based on how much you plan on working with this and how many people you believe will open their eyes to Organo Gold because of you, you should decide which package to go for. When we speak about the different Organo Gold starter packages there are two things you need to know. One thing is what you can actually find in the starter package, in other words the products you actually get included in the package. The second thing to consider, which might be more important, is that your starter package will later set your commission level. So, read on about the different packages and make your choice. These are the products you get included in your bronze package. But, what about commission? If you enter into Organo Gold with a bronze package you will be entitled to 10% commission later within your network, but to get this you will need to have two persons added to your network first, this is the so called dual team bonus. You will also earn from sales made directly from your Organo Gold shop, and if anyone enters having you as their sponsor you will receive a Fast Start Bonus because of this. You can later inside the Organo Gold control panel upgrade to silver and to gold package if you feel sorry about just starting with a bronze package. To be entitled for the 10% commission you will need to order yourself from Organo Gold every month for a value of 50 in qualification value. 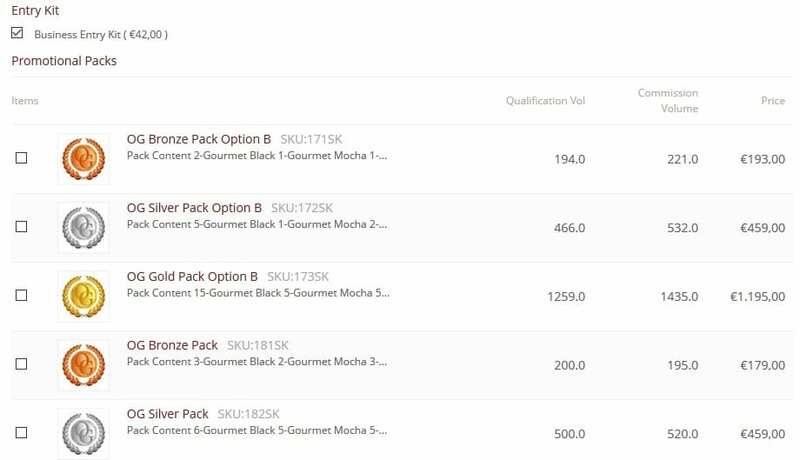 For example if you buy a OG 3 Pack consisting of Black Coffee, Latte and Mocha which cost 55 Euro you will already have received this qualification value. And do not forget that you can sell on your own products which you buy with distributor prices to friends and colleagues at retail prices, or simply give them away as presents. 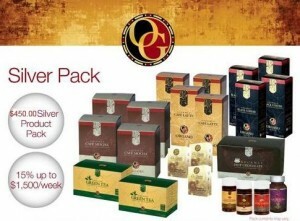 The Organo Gold Silver Package consist of the following products. If you enter Organo Gold with a silver package you will be entitle to a commission level of 15% as a dual team bonus, which you will receive as soon as you have two persons beneath you in the system, having you as their sponsor. You will of course receive bonus as you sponsor someone, the fast track bonus as well. To be entitled to the 15% commission you will need to buy monthly from Organo Gold achieving a 100 Commission Value. This can for example be earned buying an OG 6 pack consisting of 2 Boxes of Black Coffee, 2 boxes of Gourmet Mocha and 2 boxes of Latte. 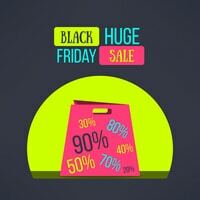 You can of course also buy any other products instead, just make sure that you reach a monthly 100 commission points. These are the products included in the Gold Package that you can buy as you sign up to become an Organo Gold distributor. The commission later that comes with the Gold Package is 20%, but notice that you will need to earn your 100 commission each points here as well, meaning that you will need to buy Organo Gold products for about 100 Euro a month to get your commission later. But again, if you have people around you who want to get their hands of these products and drink their favorite organic Organo Gold tea and coffee every month, then buying so that you will get your 100 Commission Points should not be that hard. Based on this information you should now be able to make a good decision whether you should enter and join Organo Gold buying the bronze, the silver or the gold package. If you are more into tea than into coffee and wonder how much tea you will need to buy each month to reach either 50 or 100 in your qualification volume that will later make you entitled for earning commission, then here are some examples of how many points you will earn per product. Get started with Organo Gold and if you have questions or comments, just write! 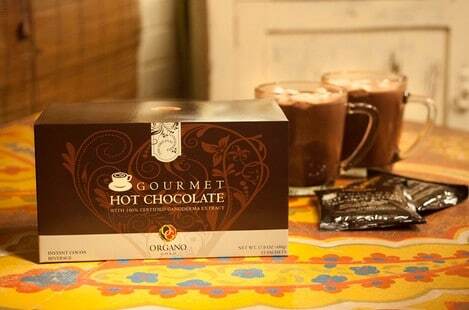 Which are the most healthy Organo Gold products? How to buy from Organo Gold with distributor prices without buying a bronze, silver or gold package?